Providing you the best range of cashew nut belt sorter with effective & timely delivery. 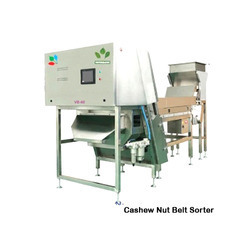 Our Cashew Nut Belt Sorter is capable of sorting cashews on maximum efficiency. These machines are engineered by expert professionals who use best components from all over the world. Our all machine are having very high rate of success in removing the impurities like discolored grain, insect damage grain, other spotted grain, and light yellow in rice or any other impurity of discolor which is the major object of sorting.